It has always pained me a great deal that so many people all over the world are genuinely fascinated by ancient Egypt and yet they are so woefully misinformed by sensationalist media, so-called documentaries based in pseudoscience, and the fantasy world of Hollywood. No other ancient civilization is so universally recognized and yet so thoroughly misunderstood. Sadly, Egyptologists are often so frustrated by this that they want nothing to do with the situation; it’s not just a matter of educating people, it’s completely reeducating them, trying to reverse the damage caused by ‘The Mummy’ and even the Discovery Channel. When I tell people that I’m studying Egyptology, people always assume that this means pyramids and mummies, the only things they know about Egypt. In fact these areas are so popular that they are overrun by untrained theorists and most Egyptologists shun them rather than tackling all of the misinformation. Sometimes I can hardly blame them; even as a lowly student, I was once approached at a conference by a man who wanted to show me the home experiments that he’d carried out, pulling miniature pyramid blocks in his backyard! The sad thing though is that many people prefer madcap theories to the truth, especially when genuine research is presented in dry academic speak rather than the exciting Indiana Jones-style of tv. I think it’s rather more inspiring to think that human beings, our own ancestors, created such spectacular monumental achievements. However, some people see the concept of civilization as progressive, that humans only continue to improve upon the past, so they think that just because we are uncertain about how the pyramids were built and we ourselves would struggle to replicate their achievement, it is impossible that humans of the past could have done it. They say that since the pyramids of Giza were built about 4500 years ago, people back then couldn’t have been skilled enough to do it. However, we’re ignoring that numerous remarkable developments were happening all those millennia ago. There are many things that were discovered in the distant past that still serve us today. The Egyptians made many brilliant innovations (something I will have to write more about in another post): simple things that we still use today, which have barely changed over the millennia since they first conceived, from the earliest forms of paper and ink, to the 24 hour day. People say that since we wouldn’t be able to build pyramids today, that the Egyptians couldn’t have done it, but it’s not just building of the pyramids that couldn’t be replicated today. It’s hard to imagine ever being able to pull together the resources, power, money, skilled craftsmen, and architects needed to build one of the great gothic cathedrals in this day and age. It just couldn’t happen. This isn’t something to be ashamed of though, we simply use different technologies and have different priorities these days. While we couldn’t build another Notre Dame Cathedral or Great Pyramid, modern structures like the Eiffel Tower or the Gherkin wouldn’t have been possible back then either. Pyramids were possible simply because the entire economy, resources, and population of the Egyptian civilization was under the control of a single omnipotent ruler, who could mobilize them all into a monumental building project. To argue that just because we don’t know every detail about how the pyramids were built would be a logical fallacy (an argument from ignorance) and does not prove that aliens must have built them. We have so much evidence that strongly indicates that the Egyptians themselves were responsible for building the pyramids. We have archaeological evidence of their construction: remains of the quarries, roads, tools, records of the workers and the towns in which they lived. We know why they built them and we can even observe their lengthy and imperfect evolution before they reached their architectural peak with the Great Pyramid. To properly address the issues out there, I will cite from a number of websites that support the theory that aliens built the pyramids and some of the comments that individuals have posted there, and explain why they are incorrect. I randomly chose a number of sites from the top Google search hits for aliens and pyramids. I don’t want to single anyone out or anything, so I won’t use any names attached to the comments. The various websites from which they derive are listed at the end of this post. I am no great pyramid expert myself, so I must acknowledge an enormous debt to the work of Mark Lehner and Dieter Arnold, from whom most of my information derives, along with other Egyptological sources, all of which are also listed at the end. I’d recommend Lehner’s ‘The Complete Pyramids’ as the best general book on the subject if you want to learn more. It is very readable with lots of illustrations and diagrams. Referring to the alien theory, someone states: ‘It’s the most sensible theory. Why would ancient Egyptians build such monstrosities just to bury their kings?’ Alien theorists say that it’s a mystery why the Egyptians or other ancient people would build such immense monuments. Therefore, it must have been aliens. But why on earth would the aliens want to build these monuments? And on earth? That makes even less sense. We definitely know the purpose behind the building of the pyramids. They were used as tombs for the ancient Egyptian kings, but they represented much more than just a grave. They were iconic symbols of the supreme power of the ruler; what better way of showing your subjects who’s boss, than conscripting them to build you a monolith that dominates the entire landscape? Above all, they were monuments to divine Egyptian kingship, the place where the king would be transformed into a god. One of the most important Egyptian myths tells how an ancient king named Osiris was murdered by his evil usurping brother, who in turn was eventually defeated by the rightful heir to the throne, Osiris’ son Horus. In death, Egyptian kings were thought to take on the role of Osiris, the ruler of the underworld, while their son assumed the role of Horus and the kingship. And although deceased, the former king would join the eternal cycle of life to be reborn everyday with the sun god. The pyramid was thought to facilitate this. This also legitimized the rule of the successor to the throne, since the pyramid was a symbol of his father’s new divinity. There are a number of reasons why these tombs were built in a pyramidal form. First of all, they developed out of an older form of monumental royal tombs called mastabas, which were flat-roofed rectangular buildings, that an enterprising architect named Imhotep then decided to adapt by stacking one on top of the other into a step pyramid form. Also, the pyramid was intended as a place of rebirth. An Egyptian creation myth tells of the birth of the world as a primeval mound rising out of the waters of chaos. The pyramid is a stylized mound. In a country where the sun is always shining, the sun god Re was the supreme deity, and the king aspired to join him in being reborn every dawn. The pyramid form echoed the rays of the sun and its staircase like form allowed it to serve as an instrument of ascension. Each of the pyramids was capped with a pyramidal stone block, or pyramidion, and the carvings on the one from Amenemhat III’s pyramid at Dashur confirm its celestial role for the king; it is inscribed with a pair of eyes looking up at the sundisk and hieroglyphs that read ‘Amenemhat beholds the perfection of Re’. The ancient names for the pyramids themselves reveal a great deal about their purpose as royal monuments and symbolic locations for the king’s divine transformation and journey to heaven. The Great Pyramid is called ‘Khufu’s horizon’, and the other two Giza pyramids are called ‘Great is Khafre’ and ‘Menkaure is Divine’. Other pyramid names include ‘Djedefre is a Sehed-Star’ and Sahure’s ‘Rising of the Ba-Spirit’. Just because the Egyptians were interested in the celestial aspect of the afterlife though, doesn’t mean they had to be inspired by aliens. People throughout history have been fascinated by the stars, and I don’t think anyone’s calling Galileo an alien. The pyramids themselves were clearly part of Egyptian religious tradition, forming the focal point for the worship of the deceased king. Some of the rituals involved cleaning, dressing, and offering food and drink to statues of the king, who was undoubtedly human rather than green or tentacled. We actually have records of the day-to-day activities centred around the pyramids. 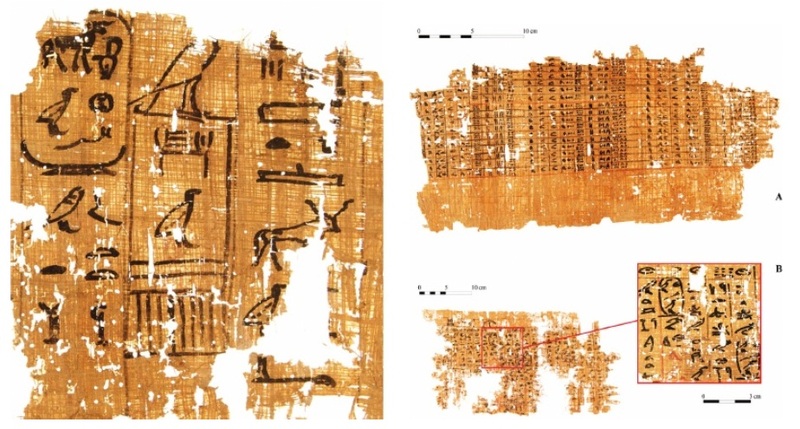 The Abusir papyri preserve detailed records of the daily activities at the pyramids and of the people who worked there, including schedules of priest and guard duties; inventories of pyramid temple equipment; financial accounts; lists of goods supplied and stored; and records of architectural inspections. The Egyptians had strong cultural, religious, and political reasons for building the pyramids and there is no reason to question their purpose. A recent survey of UNESCO World Heritage Sites rated the Giza Pyramids as one of the 25 most poorly maintained. There are extensive plans to greatly improve the Giza Plateau, but they are unlikely to be popular with local inhabitants who make their living there, since a key part is removing them from the site. The issue of protecting and developing archaeological sites while balancing the needs of Egyptians, archaeologists, and tourists has been much in the news lately, so I thought Iâ€™d offer some of my thoughts about the negative impact of local activity at archaeological sites and the subsequent relocation of local populations, like at Gurna, Luxor, and Giza. The story about bulldozers being brought into the village of Gurna near the Valley of the Kings back at the beginning of December to forcibly remove roughly 3,200 households reluctant to leave was quite widely reported. 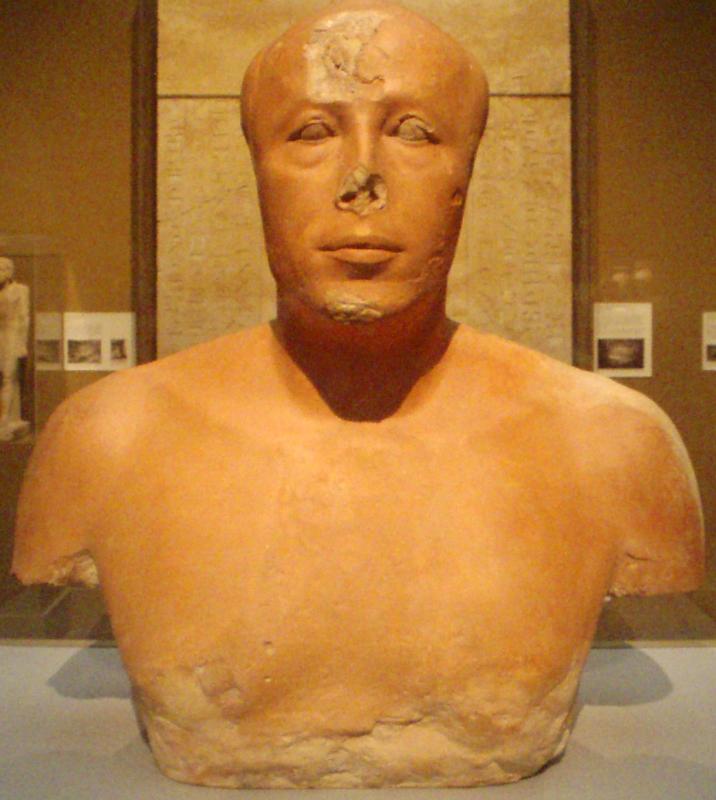 These people were living directly amongst the Theban Tombs of the Nobles, mostly dating to the 18th Dynasty. The tombs in question contain some of the most exquisite artwork in the world. While the royal tombs in the Valley of the Kings may be grander, the decoration in the tombs of the nobles is still incredibly skilled with the added charm of the subject matter of everyday life. Rather than taking my word for it, take a look at these photos from the tombs of Sennefer, Ramose, and Menna. However, the situation in the village of Gurna has made it extremely difficult to visit them. When I visited last year in December, it was practically deserted compared to the throngs of tourists overflowing the nearby Valley of the Kings. Likely this is partially because the site is far from accessible. Just trying to find particular tombs hidden amongst the minefield of houses, souvenir shops, goats, dogs, children, rubbish, and would-be tour guides, was challenging. While removing the buildings and people from on top of these tombs is unquestionably the best measure to preserve and protect them, it raises many issues about the rights of the local people who have lived there all their lives. Many of them descendents of the 19th century tomb-robbers of Gurna, they owe their livelihoods and their own unique culture to their relationship with the tombs and tourists. 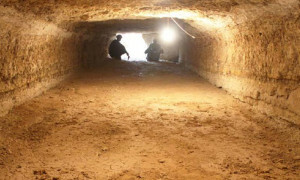 Their story was immortalised in Shadi Abdel-Salam’s epic film, Al-Mumia (Night of Counting the Years), in which a conflicted young villager struggles with the dilemma of whether to follow the tradition that feeds his family by selling the treasures of the hidden tombs or to preserve their ancient history by handing them over to the government. A captivating article by Fatemah Farag in the Cairo newspaper Al-Ahram further describes the desire of both locals and outsiders to preserve the unique history and heritage of the people of the mountain. In the end, the eviction of the Gurnawis boils down to yet another chapter in the age-old conflict between Western values and the interests of modern Egyptians. This particular struggle at Gurna has been ongoing since the governmentâ€™s first unsuccessful attempt to remove the villagers in 1948. It’s a uncomfortable situation when the dead are given priority over the living, the needs of Egyptologists and foreign tourists over the lives of the local people. I certainly have mixed feelings over the issue. But while it is easy to express pity and guilt over the sidelining of the villagers and their needs, as a tourist and an Egyptologist I canâ€™t deny that I wouldnâ€™t prefer to be able to visit the Tombs of the Nobles without being stalked by wizened old men unnecessarily trying to read names in hieroglyphs for me, while repeatedly making the same unamusing wisecrack about Canada and demanding baksheeh (tips). There are plans to restore the ancient, sphinx-lined processional way linking the great temples of Karnak and Luxor, the beginning of which can be seen in this photo. Stretching over three kilometers, the planned road would cut a 60- to 70-meter-wide swath right through a largely residential area of modern Luxor. The ceremonial route was the focal point of the immense Opet festival, in which the king and the sacred statues of Amun and his divine family travelled from his temple at Karnak to the temple of Luxor. The planned road will stretch over three kilometers and cut a 60- to 70-meter-wide swath right through a largely residential area of the modern city. The people who are unfortunate enough to be living in the wrong place will be moved to apartments in a proposed new city that is to be built on the edge of Luxor. When I was in Luxor, I met a shopkeeper who was one of the people who was going to be moved. While he was glad that he wasnâ€™t just being turned out and would at least receive a new home in compensation, he was still unhappy about the situation in general and regretted being forced to leave. In this case though, the eviction is not for the sake of protection of monuments or the archaeology, but purely to increase tourist profits. It seems a bit strange that this is being done when there are so many other places where urban settlement makes excavation of important archaeological sites impossible. I hope at least the end results will be spectacular enough to somewhat justify the expense of the people who lived there. An eviction of a different sort is planned for the site of the famous Pyramids at the Giza Plateau. The master plan for the development of the site will prevent access to the illegal vendors and touts that overrun the site, in addition to cutting off vehicular access and removing all the inappropriate modern developments to the plateau. And perhaps just in time too. In a recent review of 94 major UNESCO World Heritage sites by George Washington University in cooperation with National Geographic, Egyptian sites are all among the bottom-25 of the list, the Pyramids ranked as the lowest, receiving only 50 out of a possible 100 points. My own impressions were the same when I visited the Pyramids. I was appalled by the way tourists were constantly hounded by trinket-sellers and camel ride operators, with not a momentâ€™s peace to spend in quiet contemplation of the worldâ€™s most magnificent monumental structures. Everywhere we went we trailed an entourage of Egyptians pressing everything from bookmarks to postcards on us as we kept up a constant chorus of â€˜La, la, la!â€™ (â€˜No, no, no!). I saw one girl who was being harassed actually break down in despairing, outraged tears and fling her water bottle at her unwanted pursuers. Men soliciting tips in exchange for unofficial tours outright lied to my friends and I about the opening times of the Great Pyramid in an attempt to lure us away from it. They told us all sorts of incorrect information about the queensâ€™ pyramids and claimed that they would show us mummies in them. There most certainly arenâ€™t any mummies in the pyramids anymore. It was incredibly disappointing that an experience that I had dreamed of all my life was so horribly marred by the situation there. Biased as I am, I certainly donâ€™t have the answer, but I believe that Giza belongs to posterity and that while the Egyptians should certainly benefit from the Pyramids, it is the responsibility of us all to preserve their heritage. Gardener, P. (2006). Reusing Roman Monuments in Arles and Nimes: An Evaluation of Heritage Management Strategies in Local Government. Oxford, University of Oxford. A recent story has resurrected a previously rejected theory that part of the pyramids were in fact made of concrete rather than carved limestone blocks. Scholars have debated amongst themselves for decades over how the pyramids were built, but this latest proposal seems to have the majority of them up in arms with Zahi Hawass stating that the theory was ‘plain stupid…To suggest otherwise is idiotic and insulting.’ American pyramid expert Mark Lehner said: ‘All studies of the stone have shown they are made mostly from limestone but also from basalt and granite mined in the region.’ Certainly there is clear evidence that at least some real limestone blocks were used to build the pyramids are there numerous quarries nearby with stumps of removed blocks still visible (Arnold 1990, 31). Findings published in the December issue of the Journal of the American Ceramic Society state that electron microscopy performed on samples from the pyramids showed that their composition was different from limestone samples taken from around the area and suggested that the elements had been together in a solution. Apparently, the Egyptian government is unaware of how the samples were obtained and certainly did not give permission for their removal from the monument. I’d like to point out that not only does this call their methods into question, but it also raises several serious concerns with the nature of the samples. 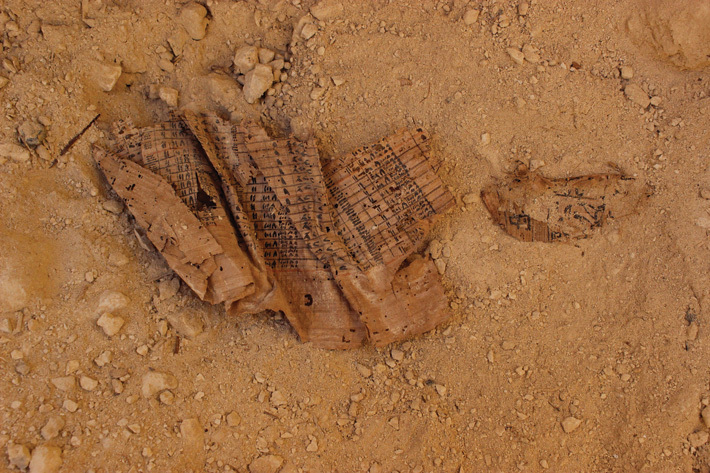 If they were removed secretly without permission, the samples are unlikely to be very large and might even represent traces of the mortar used to hold the blocks together rather than the building material itself. 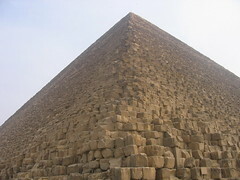 Nor are the samples likely to be representative of the entire pyramid; since climbing the pyramid is illegal, they must have been taken from the base. Eugene Cruz-Uribe, Egyptology professor at Northern Arizona University, commented on Mark Morgan’s blog: ‘I reviewed an article a number of years ago on the pyramids as cement issue. Seems the authors of that proposed article a) illegally extracted samples and b) did poor science. Article was rejected for publication.’ It seems that this has happened yet again. Not knowing enough about material science, chemistry, engineering, or any of those things, I’m not really in a position to give a serious critique of the article. I’m not so sure about the scientific qualifications of the Egyptologists who are so violently condemning the research either though. While the scientists’ methods are certainly questionable, I’d like to hear more before I make my final judgment. It seems like most scholars have been very quick to dismiss the theory entirely rather than pursue further investigation. I think occasionally Egyptologists associate themselves too closely with the ancient Egyptians and might take the suggestion that the pyramids were not as difficult to build as previously thought as an insult to their engineering prowess. However, I think that if it turned out to be true it would simply be further testament to the Egyptians’ ingenuity and innovation. They pioneered a great many inventions that are still used today, from paper to scissors! So why not concrete too? They certainly used plaster and other similar materials. And there were definitely an awful lot of blocks- Lehner estimates that 9 million tonnes of stone were quarried for the pyramids built between the reigns of Snefru and Menkaure! (Lehner 1985, 109). And however the pyramids were built, they’re still the most enduringly impressive buildings in the world. Arnold, D. 1990. Building in Egypt: Pharaonic Stone Masonry. Oxford, Oxford Â Â Â Â Â Â Â Â Â Â Â Â University Press. Aston, B., etc. 2000. ‘Stone’ in Ancient Egyptian Materials and Technology, eds. Â Â Â Â Â Â Â Â Â Shaw and Nicholson. Cambridge, Cambridge University Press. Lehner, M. 1985. ‘The Development of the Giza Necropolis: The Khufu Project’. Â Â Â Â Â Â Â Â Â Â Â Â MDAIK 41, 109-143. Lehner, M. 1997. The Complete Pyramids. London, Thames and Hudson, Ltd.